Най-напред 28 души загинаха в самолетна катастрофа, а по-късно островната държава в Южния Пасифик бе разлюляна от силно земетресение. Самолетът се разбил на 20 км южно от Маданг. Сред оцелелите са австралийски и новозеландски пилот, стюардът и пътник-китаец. Самолетът Даш 8 (P2-MCJ),на авиокомпанията Airlines PNG летял от град Лае до курорта Маданг, когато попаднал в силна буря. Повечето от пътниците били родители, пътуващи за церемонията по дипломирането на децата им в университета в Маданг. Докато страната оплакваше жертвите, бе ударена от трус с магнитуд 6,7. Този и други подобни случаи на непосредствена последователност "авиокатастрофа - земетресение"създават впечатление за връзка между тези събития. с 32 пассажирами совершал рейс 1600 из города Лаэ в Маданг. Авиакрушение произошло на северном побережье Папуа-Новой Гвинеи. Самолет не долетел до места назначения всего около 20 километров. Погибло 28 человек. Четверым удалось выжить при крушении. По информации издания The Australian, большинство пассажиров самолета были родителями, направлявшимися на церемонию окончания университета, которая должна была пройти в эти выходные в Маданге. Причины катастрофы пока неясны, однако жители Маданга сообщают, что в районе аварии во время крушения была сильная гроза. The Airlines PNG Dash 8 airplane (P2-MCJ) crashed while flying from Lae to the resort hub of Madang, Papua New Guinea. 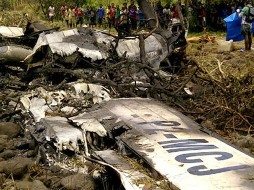 The twin-propeller plane went down in bad weather 20 kilometers south of Madang killing 28 occupants. There were four survivors – three crew members and a passenger. Most of the passengers were parents travelling to attend their children's university graduation ceremony in Madang this weekend, according to the Australian Associated Press news agency. Two pilots, one Australian and one from New Zealand, were among those who survived Thursday's crash. One flight attendant and one passenger also survived. One of the survivors told a nurse he fled the burning wreckage through a crack in the fuselage. The pilot, Capt. Bill Spencer, 64, who survived the crash, has 45 years flying experience, including 35 years in Papua New Guinea, the airline said. First Officer Campbell Wagstaff, who also survived, has more than 2,500 hours flying experience. Airlines PNG said it has launched a full investigation into the cause and will be examining potential factors including weather, fuel and possible mid-air fire or mechanical problems. The airline said it has temporarily grounded its 11 remaining Dash 8 aircraft. Four investigators from Australia's Air Transport Safety Bureau arrived in Port Moresby to assist the PNG Air Investigation Commission. 01.10.2011*/US/ SD/ Philip - A Robinson R66 Turbine helicopter (N266CY) crashed in a pasture killing the pilot. */Australia/ NSW/ Taree/ Old Bar - Cheetah Sierra 200 ultralight plane (24-7634) into a ferris wheel at a rural festival in eastern Australia trapping two children on the ride and two adults in the aircraft for hours. No injuries. */US/ CT/ Ridgefield/ near Danbury Municipal Airport (KDXR) - Mooney M20K/231 plane (N231EB) crashed shortly after takeoff injuring the pilot. */Philippines/ Jolo island/ Sulu province/ Patikul township/ Mount Sinumaan - Philippine Air Force Bell UH-1H Huey helicopter lost engine power as it approached military Camp Baladad and attempted a precautionary landing but crashed into Mount Sinumaan killing 3 soldiers and injuring 1 on board. */Poland/ Nysa/ Glebinow - Tomark Viper SD-4 ultralight plane (OM-M025) crashed while was performing aerobatic manouvers. Both occupants were killed. */Poland/ Warszawa Babice (EPBC) - Urban Air UFM-10 Samba XXLultralight (OK-OUA 58) flipped upside-down on landing. The pilot was slightly injured. */US/ MO/ Jefferson City - One person has been taken to a hospital after a Sikorsky MH-60R Seahawk military helicopter crashed at Jefferson City Airport. */US/ KS/ about 20km west of Manhattan - Rans S-7 Courier plane (N2417T) crashed shortly after takeoff due to an engine failure. Both occupants were injured. 02.10.2011*/Ireland/ County Roscommon/ about 8km from Athlone/ Taughmaconnell - A Robinson R44 Raven I helicopter (EI-DTR) crashed shortly after takeoff. */US/ WV/ NW area of Rockingham County/ Bergton - A Piper PA-32R-300 Lance plane (N115CL) with 3 people on board missing. */US/ CO/ Brush Municipal Airport (K7V5) - A Bushby Mustang II plane (N287BM) crashed and flipped upside down on landing. Both occupants escaped with minor injuries. */Sudan/ Khartoum-Civil Airport (KRT) -Sudan Airways Fokker 50 passenger plane, ST-ASD, sustained damage in a gear-up landing at Khartoum-Civil Airport (KRT), Sudan. No one was injured in the incident. 03.10.2011*/US/ MA/ Boston - Turbulence! - Nine people on a JetBlue flight from San Juan, Puerto Rico to Boston reported injuries on Sunday night, including at least one who spilled hot coffee on himself. Emergency medical technicians treated four people on the ground but no one had to be hospitalized. */US/ MA/ Boston -Turbulence! - Authorities say 11 people on a Lufthansa flight from Charlotte, N.C. to Munich, Germany also reported being hurt after the plane was forced to land in Boston. Some of those passengers being loaded into ambulances. 04.10.2011*/US/ TX/ South of San Juan and Alamo - A Eurocopter EC120B Colibri crashed injuring slightly the 2 occupants. */US/ FL/ Western St. Lucie County - Air Tractor AT-502B plane (N90805) crashed on takeoff injuring critically the pilot. */Japan/ Kanagawa Prefecture/ Kiyokawa village - Eurocopter AS350 B3 helicopter crashed injuring the 2 occupants seriously. 05.10.2011*/US/ VA/ Wytheville - A small experimental aircraft - A Rand Robinson KR2 2003 plane (N7026G) crashed Thursday near the Mountain Empire Airport in Wythe County killing the pilot. */US/ NC/ Currituck County/ Moyock - Aviat A-1 Husky plane (N11HU) crashed killing the pilot. */Canada/ AB/ about 1km southeast of Drayton Valley Industrial Airport (CER3) - A Bell 206 JetRanger helicopter crashed in windy weather killing the pilot. */US/ MO/ Bransom - M. Graham Clark Field/Taney County Airport (KPLK) - A Lancair Legacy 2000 plane (N92SX) crashed on landing. */US/ MO/ Fortuna-Versailles - A Kolb Mark III experimental plane (N9144E) crashed injuring seriously the pilot. */US/ OH/ Centerburg - Piper PA-38-112 Tomahawk plane (N6403A) ran out of fuel and made a forced landing in a cornfield. No injuries. */US/ FL/ Punta Gorda/ Charlotte County Airport (KPGD) - A Cessna-150L plane (N11280) crashed on landing. No injuries. */US/ FL/ Leesburg International Airport (KLEE) - A Remos GX plane (N208GX) collapsed the nosewheel on landing. */US/ MI/ Holland's Tulip City Airport - A Quickie Q200 plane (N2935R) crashed on landing killing the pilot. 07.10.2011*/Afghanistan/ Kunduz - NATO's drone crashed. */US/ Hawaii/ 10 miles off Hilo - An American Air Services Cessna T310R plane (N23BT) ran out of fuel and landed in the waters of Pacific ocean. */US/ NY/ Warrensburg - Unregistered ultralight plane crashed killing the pilot. 08.10.2011*/US/ MO/ Easton - A Taylorcraft BL-65 plane (N27492) crashed on takeoff in a bean field. The pilot was taken to hospital with a broken nose. */US/ PA/ Carbon County/ the Lehigh River in Franklin Township - A Breezy RLU-1 ultralight carrying two people crashed about four minutes after takeoff into the river. One of the people onboard suffered minor injuries. */US/ GA/ Quitman - A Luscombe 8A Silvaire plane (N41907) crashed in a hay field. The passenger was killed and the pilot suffered minor injuries. */France/ Herault/ between Pouzolles and Laurens - An Ayres S2R-T34 Turbo Thrush plane (F-GRIO) crashed when a sudden gust of wind caused it to hit the ground and caught fire. The pilot escaped with a slight head injury. */Australia/ Melbourne/ Into a creek near Tooradin Airfield (YTDN) - A Cessna U206F Stationair plane (VH-EUW) with 6 occupants crashed injuring the pilot and 1 of the skydivers on board. 09.10.2011*/US/ TN/ Sumner County/ Westmoreland - Aeronca L-3A (O-58A) Grasshopper plane (N46513) crashed on takeoff injuring slightly the pilot. 10.10.2011*/Bangladesh/ Zahurul-Haque AB/ Shah Amanat International Airport (VGEG) - An A-5C training aircraft of Bangladesh Air Force crashed near the runway. The pilot ejected and survived with minor injuries. 11.10.2011*/Brazil/ SP/ Sao Paulo - A Robinson R-22 Beta helicopter made a forced landing and crashed. 12.10.2011*/US/ MO/ Charles B. Wheeler Downtown Airport (KMKC) - A Flight Express Inc.Cessna 210M Centurion cargo plane (N7660E) made a belly landing. */Gabon/ Port Gentil Airport (POG) - An Embraer 120ER Brasilia passenger plane (ZS-PYO) operated by Nationale et Regionale Transport sustained substantial damage in a runway excurion accident at Port Gentil Airport (POG), Gabon. There were 27 passengers and three crew members on board; four passengers suffered minor injuries. 14.10.2011*/Poland/ Biecz/ Bugaj - A Zenair CH 601 HD Zodiac plane (SP-YOK) crashed killing a couple. */US/ OK/ Okmulgee - An ultralight plane hit power lines and crashed injuring the 2 occupants (a man and a woman). */US/ MO/ Ozark/ Christian county/ Gimlin Airport (18MO) - A Cessna 172P Skyhawk plane (N54356) over shot the runway on landing and flipped over. */US/ TX/ Fort Worth/ Meacham International Airport (KFTW) - A training Hughes 269A helicopter (N10375) was hovering over taxiway B when the pilot encountered some sort of problem and had to put the aircraft on the ground. */Switzerland/ VD/ north of Fontaines-sur-Grandson/ near Petit Beauregard - Piper PA-28-140 Cherokee Cruiser plane (G-BBEF) crashed in a wooded area killing both occupants ( a British and a Swiss). A Cessna 208B Grand Caravan (A2-AKD) was destroyed when it crashed near Xaxanaka, Botswana. The British pilot and seven passengers from France, Switzerland and Britain were killed. The airplane crashed immediately after takeoff from Xakanaka Airstrip on a flight to Pom Pom Camp Airstrip in the Okavango Delta, Botswana. There were four survivors from the crash. A French man who was badly burned, and his wife, who was uninjured, have been transferred to Milpark Hospital in Johannesburg, in neighbouring South Africa. One, named as Bernard Lottering, told a local newspaper from his hospital bed that after the aircraft hit the ground he kicked out the window and managed to escape as the aircraft burst into flames. Once outside, he managed to pull out his colleague and two other passengers, thought to have been the French couple, to safety. The plane, operated by Moremi Air Charters, was heading to the island of Pom Pom, a luxurious safari destination in the north, but crashed soon after take-off. Resume: 8 killed, 3 injured in the crash. 15.10.2011*/Germany/ St. Michaelisdonn/ Donner Kleve - A Schempp-Hirth Mini-Nimbus HS 7 glider (D-0188) crashed on approach killing the pilot. */Russia/ Volgograd Region/ Erzovka - A Robinson R44 Raven helicopter (RA-04332) made a hard landing injuring the 4 occupants, one of them seriously. */Canada/ NS/ Grand Lake - A Maule M-5-210C Strata Rocket floatplane (C-GSBI) made an emergency landing in the lake but crashed and was damaged. */US/ CA/ Susanville/ Spaulding Airport (1Q2) - Avid Flyer experimental plane (N4077B) made a forced landing and was damaged injuring slightly the pilot. */US/ AL/ Pell City/ St. Clair County Airport (KPLR) - A Denney Kitfox II plane (N67WP) ran into a pond on landing due to a break failure. */Indonesia/ Makassar/ Hasanuddin International Airport (WAAA) - A man was killed when he was hit in the face by the propeller of a CASA/Nurtanio 212 Aviocar 200 airplane. */US/ FL/ Northeast Florida Regional Airport (KSGJ) - A North American P-51D Mustang plane (N751RB) collapsed the right landing gear on landing causing the plane to spin off the runway and came to rest in the grass. */US/ FL/ DeLand Municipal Airport (KDED) - A Piper PA-18-160 Super Cub plane (N929SC) was performing touch-and-goes, when one of the landing gears collapsed and the aircraft flipped over. */Venezuela/ Bolivar/ Sector Santa Rosa - A Corpoelec Bell-412SP helicopter (YV0126) fell on the trees injuring all 7 on board, one of them seriously. */Australia/ QLD/ Brandon/ 2 kilometers north of Ayr Airport - A Cessna 182P Skylane plane (VH-TIS) crash landed into cane fields south of Townsville after a bird collided with the plane's windscreen. The six people onboard had minor injuries only. 16.10.2011*/Kenya/ Liboi - A Kenyan Air Force Hughes 369D helicopter crashed and caught fire on takeoff killing all 5 soldiers on board. */US/ TX/ near Airpark East Airport (K1F7) - Evans VP-1 Volksplane crashed on Highway 205 at Dower Road shortly after takeoff injuring seriously the pilot. */US/ CT/ Danbury - A Cirrus SR22 GTS G3 Turbo plane (N438CP) crashed, after it clipped a 70-foot tower and then a house at 58 Wooster Heights Roads as it approached Danbury Municipal Airport - KDXR. The pilot was killed. */Belgium/ Verviers-Theux (Laboru) Airfield (EBTX) - A Piper PA-18-95 (L-18C) Super Cub plane (OO-KKK) crashed just after takeoff killing both occupants. */Germany/ about 20km southwest of Kiel/ local part of Langwedel/ Blocksdorf - A Lancair 235 plane (D-EHAR) crashed in a corn field killing both occupants. 17.10.2011*/US/ KY/ Scott County/ Georgetown - An ultralight plane clipped power lines seconds after takeoff from a field injuring the pilot. */US/ MA/ Berkley - Aeronca 7AC Champion plane (N3662E) struck at least one tree on landing, crashed and flipped over injuring the pilot. */Malaysia/ 7km SE of Kuala Selangor/ Kampung Assam Jawa - A Socata TB10 Tobago GT trainer crash-landed in a mangrove swamp. */US/ VA/ Williamsburg - A Cessna R172K Hawk XP plane (N758GY) crash landed at High Street, near Richmond Road, Williamsburg, after engine troubles. */New Zealand/ Arrowtown - A Cessna 172N Skyhawk plane (ZK-JFI) crashed on approach killing the pilot and seriously injuring the 2 passengers. 18.10.2011*/India/ Pradesh/ near Lahaul- Spiti in Himachal -An Indian Air Force (IAF) MiG-29 fighter jet crashed into a mountain during a night flying exercise. The pilot missing. */Belgium/ about 10km east of Liege (Luik)/ Soumagne - An Eurocopter EC120B Colibri (OO-HCI) crashed in garden of a house killing both occupants. */US/ AZ/ Phoenix Sky Harbor International Airport (KPHX) - A Beechcraft D17S Staggerwing plane (N44562) made a belly landing. No injuries. */US/ NC/ Cox-Grantham Airfield - A small plane struck a power line on landing and flipped over injuring slightly the pilot. */US/ WI/ Watertown - With the plane's windshield covered in oil, a pilot landed the small aircraft on a city street in Watertown and hit a moving car. No injuries. */Nepal/ Baglung District/ Dhorpatan - A Pilatus Britten-Norman BN-2T Turbine Islander plane (RAN-49) of the Nepal Army Air Wing, performing an ambulance flight, crashed in a dense forest near Dhorpatan and caught fire. All six occupants were killed. There were two crew members on board, along with a doctor, nurse and a relative of the sick person. 19.10.2011*/India/ Jharkhand/ 40km near Khakra village/ Kolad forest - Three crew members of a Border Security Force (BSF) Dhruv helicopter (VT-BSH) died when it crashed at Kolhad village, under Namkom police station in Ranchi. 20.10.2011*/US/ NC/ Ft Bragg - A special operations soldier hurt in a parachute accident. */Tanzania/ 20 km west of Kilimanjaro International Airport - A Piper PA-34-220T Seneca III plane (5H-QTE) crashed on approach killing the co-pilot,, injuring the pilot. */Botswana/ about 60 km west of Gaborone/ near Letlhakeng - Two Botswana Defence Force Pilatus PC-7 Mk.II Turbo Trainer planes collided in a mid-air. One crewmember reported killed and the other three ejected. */Pakistan/ about 26 kilometers from Karachi/ near the Super Highway - Schon Air Piper PA-34-220T Seneca III plane (AP-BDK) made an emergency landing and was damaged. 21.10.2011*/Switzerland/ Lac Leman - Lufthansa Airbus A320-211 plane (D-AIQD) diverted to Zurich Airport (ZRH/LSZH), Switzerland after the crew noted an inexplicable acrid smell in the galley. The aircraft landed safely, but three crew members were taken to hospital with respiratory problems. 22.10.2011*/US/ MD/ Baltimore-Washington International Thurgood Marshall Airport - A Southwest Airlines jet and an airport fuel truck collided on the tarmac. No injuries. */New Zealand/ Pauanui Aerodrome (NZUN) - A Britten-Norman BN-2A Mk.III Trislander plane (ZK-LGF) suffered a runway excursion and went through a fence after the nosewheel collapsed during takeoff. No injuries. */Germany/ Korbach Airfield (EDGK) - An ultralight plane (D-MBWT) crashed at a farm land killing the 2 occupants. */US/ GA/ Washington - An experimental plane crashed killing the pilot. 23.10.2011*/UK/ Exeter Airport - A small plane made a belly landing after its undercarriage could not be lowered. */Mexico/ Veracruz/ Angela R. Cabada - A Cessna 210G Centurion plane (N5894F) crashed killing 2 Americans. */Germany/ Hirschenbuhl - AutoGyro Europe MTO sport (D-MRWZ) made a forced landing in a forest due to an engine failure. */US/ Suffolk/ near Hampton Roads Executive Airport (KPVG) - A Cessna R182 Skylane RG plane (N736WP) made a forced landing without its nosegear. 24.10.2011*/US/ CO/ Pueblo Memorial Airport (KPUB) - A training Diamond DA20-C1 plane (N942DA) crashed on landing. No injuries. 25.10.2011*/US/ OR/ Newberg - One person was killed after two small planes collided midair near Wilsonville Tuesday afternoon. One plane, Piper PA-44-180 Seminole (N3062H), made an emergency landing in Champoeg State Park and the two people onboard sustained minor injuries. The other plane, Beechcraft V35 Bonanza (N5938S) crashed in a heavily-wooded area just north of the park and across the Willamette River. */Yemen/ Lahej/ Al-Anad Air Base - A Yemeni military An-26 plane crash-landed at an air base in the south of the country early on Tuesday, killing 12 occupants, including 11 Syrian military personell and a Yemeni engineer. The plane exploded upon hitting the runway. On board were 15 occupants. Three of them were injured. */Australia/ NSW/ Bourke Airport (YBKE) - A Ted Smith Aerostar 601 cargo plane (VH-IXA) landed gear up at Bourke Airport. No injuries. 26.10.2011*/US/ OR/ NW of Heppner - Cessna 182R Skylane plane (N6545E) crashed on approach to Lexington Airport (K9S9). One occupant was killed and the other one airlifted to hospital. */US/ NY/ Southhold/ Mattituck Inlet - An unregistered Innovator Technologies Mosquito XEL ultralight helicopter crashed injuring slightly the pilot. */UK/ Cotswold Airport (EGBP) - Guimbal Cabri G2 helicopter (G-UIMB) crashed. No injuries. */US/ SC/ Moncks Corner - A Cessna-150 plane crashed near Berkeley County Airport. The pilot died. 27.10.2011*/India/ Goa-Dabolim Airport (GOI/VAGO) - ArkeFly Boeing 767-300 (PH-OYJ) aborted the takeoff from Goa-Dabolim Airport (GOI/VAGO), India after striking birds. */Canada/ BC/ Vancouver International Apt. (CYVR) - Beechcraft 100 King Air passenger plane (C-GXRX) crashed on landing killing the pilot. The co-pilot is in critical condition with 80 per cent burns. On 16 November he died in hospital. The seven passengers were serious injured. At least two people on the ground were serious injured by debris. 28.10.2011*/Mexico/ Nuevo Leon/ Monterrey (MMMY) - A Cessna 421B Golden Eagle plane (N990MW) collapsed the nosegear on landing. No injuries. */Nigeria/ near Uyo Airport - Nigerian Air Force L-39 Albatros trainer plane crashed on approach. */UK/ Derbyshire/ Ashbourne/ Darley Moor Airfield (X3DM) - A 16 year old girl, pilot of a hang glider died of her injuries after she crashed at Darley Moor Airfield. */France/ Toulouse Blagnac Airport (LFBO) - A Piper PA-31T Cheyenne II plane (OE-FKG) crashed on landing killing and injuring fatally the 4 occupants. 30.10.2011*/Yemen/ Sanaa Airport - Two Yemen Air Force fighter jets set on fire by shells fired at the airport. */France/ Injoux-Genissiat - An ultralight plane crashed injuring seriously the 2 occupants. */Turkey/ Erzurum Airport (ERZ/LTCE) - Two Ilyushin Il-76TD collided at Erzurum airport as a result of deviation of Kirgizstani Il-76 EX-036 from exact landing path. Landing plane hit the Georgian Il-76 (4L-SKN) standing near the runway with wingtip. No crew were onboard the plane at the time of the incident, but the cockpit was badly damaged. */Germany/ Essweiler - Scheibe SF-25B Falke motorglider collided with the trees and crashed. No injuries. 31.10.2011*/US/ FL/ Key West International Airport (KEYW) - Gulfstream G150 plane (N480JJ) was involved in a runway excursion accident after a brake failure. Two of the four occupants suffered minor injuries. */Mexico/ BC/ Tijuana - Ted Smith Aerostar 601P plane (N76VK) crashed into a garage shortly after takeoff killing the 2 occupants and 1 person on the ground. */Brazil/ Ribeirao Preto - Police drove their vehicle into a Piper PA-32 in an attempt to prevent it taking off,.The airplane had been used to smuggle notebooks, electronic surveillance equipment and a bicycle.